The period from 40s to 60s, when Bollywood was experiencing its golden era, Hindi cinema had one more admirer other than the Indians, the ones in the mighty Soviet Union. The biggest country of its time, one of the most powerful nations was culturally inclined towards India without much of the knowledge of common Indians. More than the politicians, it was Bollywood that made sweet and strategic relations between the two countries. (Read More: Role of Russia in 1971 Indo Pak War) It was a belief that two prominent figures from India would be known to everyone in USSR, first being Jawaharlal Nehru, and other being Raj Kapoor. Prior to the collapse of Soviet Union, Hollywood movies in erstwhile USSR were banned. The socialist country needed another source of entertainment and Indian Cinema fit well to their needs. Earlier in 50s, the USSR was recovering from the losses from the Second World War and India was also struggling to stand on its feet after a two century long colonial rule of Britain. There was similar kind of political environment in both the countries. Indian movies at that time were suitable for people of all ages and the movies gave utmost importance to the idea of family which was well appreciated in the Soviet Union. My friend Anya from Ufa, surprised me when she told me that in villages, when Indian movies dubbed in Russian were shown in cinemas, the streets used to get deserted. People would lock their homes and head to the cinema. After the collapse of the Soviet Union movies distribution system ceased to function and the advantage of this void created was taken by the Hollywood, who had aggressive and better business skills compared to the Indians. Soon American movies became popular in new Russia, and the popularity of Indian movies started diminishing. Unfortunately 90s was also the time when even in India people believed that it was the worst age of Bollywood in terms of quality of movies and talent. Indian movies started to disappear from the cinema, but they were still popular on TV. 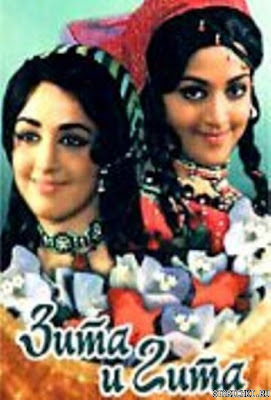 Those who were born in the later stage of Soviet Union or early stage of formation of Russia are familiar with Indian movies specially Sita aur Gita (Zita I Gita). The movie was repeatedly shown on Russian television and parents who loved this movie made their kids to watch it. While people from Soviet Union respect and love Raj Kapoor as an icon of Bollywood. The new generation admire Disco Dancer and Sita aur Gita more. My friend Elena, who was born few years before the collapse of USSR, is a proud Russian and a fan of Indian movies. When she comes to India, she turns on Indian music channels on TV and identify actors and actresses and confirms with me with her distinguishable Russian accent. I am mostly impressed with the immense knowledge of Indian cinema most of the Russians have. Bollywood is something that can enhance people to people contact between the two countries which will prove to be beneficial in the future. Bollywood has helped bringing Soviet Union and India closer, and it can help two potential superpowers come closer again. It is still not late for India and Russia to tap on this business worth millions of dollar. The Soviet generation is still there and there are still youngsters who grew up watching Indian movies on television. Considering this, Indian film industry can easily compete with Hollywood which has a history of showing Russians as not so good people. When I was doing this research, I was surprised to see a friend of mine approaching me and saying “Sanskar I have watched Indian movie.” It was a big surprise for me because I had never expected it from her, I know her for past two years, but we never talked about India or Indian movies. “Veronika, you also?” I said with a big surprise, “How? When? Where?” And she told me that her mother was a big fan of Indian movies and she watched Zita I Gita (Sita aur Gita) with her many times on TV. She is one of those modern Muscovite in her early 20s who listens to western pop music and sometimes Russian music too. Although now she doesn’t watch Indian movies, but if she has liked it once, then she can watch it again, only if India realizes the potential of entertainment business in Russia. Now Indian movies in Russia have disappeared from Cinema as well as TV. Yes, once in a while Indian movies do release in Russian cinema for example Ranbir Kapoor’s Yeh Jawaani Hai Deewani’s Russian dubbed version is set to release in few weeks. India TV, not to be confused with the news channel in India, is another hope for Bollywood loving Russians which often shows Indian movies. Internet has made accessing Indian movies very easy. It is very easy to find pirated Russian dubbed Indian movie or Indian movie with Russian subtitles online on torrents. Often Indian cultural and movie fests are organized throughout Russia and almost every time they are concluded as big success. This is enough for the two countries to harness the potential of this business for the benefit of two countries. Indian movies are often big hit in the US and the UK and that is because of large number of Indian population in those countries, that is not the case in Russia, Africa and South Asia (India excluded) and still they admire Indian movies. India can look at it as a tool. It is India’s soft power. Unlike military power, which is destructive in nature, this soft power of culture and tradition unites people. To learn more about Bollywood’s influence in former USSR, The World Reporter Research took this up as a project. We randomly asked people of former Soviet Union from different regions across the length and breadth of erstwhile USSR with the help of Social Media, online surveys and manual surveys by our friends and student journalists based in the former USSR. When we asked people if they have ever seen an Indian movie, it was surprising that almost everyone replied with a Yes. Almost everyone has seen an Indian movie some or the other time therefore Bollywood, if introduced again, will not receive an alien tag. Indian movies and tradition is more popular among Russian women than men. It is very common to see a Russian woman dreaming to be dressed or dance like an Indian. Among the people who said they have watched Indian movies, 94% of them were women and 6% of them were men. In an informal discussion with some of my Russian friends, I asked them why is that Russian women or any foreign women love Indian culture and tradition. The conclusion of the discussion was amazing and convincing. Each region of India has its own dress, customs, style of wearing Sari and accessories. Women love to get dressed beautifully and use accessories that make them look pretty. Indian women use a lot of accessories along with their traditional clothes like Bindi, Mehendi, Benda, flowers, Bangles, Gold Jewellery, Payal, toe rings and finger rings, etc. Such a huge variety can excite any woman. We wanted to know how the people in former Soviet Union came to know about Indian movies and how they began watching it. Those who are above 35 said they have been watching since Soviet time when Indian movies were shown in cinema. But we were curious to know about the present young generation. How did they start watching? Our Survey results suggested that young generation Russians were most influenced by their family to watch an Indian movie, especially by their mothers. 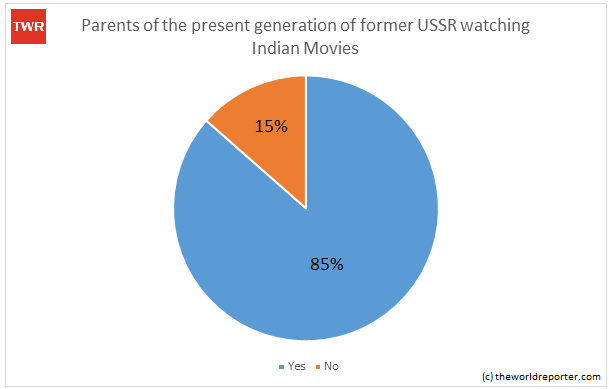 The reason behind Parents being most influential when it comes to suggest Indian movies to their kids is the popularity of Indian movies in the USSR. Looking at the impressive figure of those people who started watching Bollywood movies all by themselves, we can say that the interest for the Bollywood movie is still there among the people in former Soviet Union. We also asked the reverse question from the responders if their parents have ever watched Indian movies. The results itself gave us the idea of popularity of Indian movies in the USSR. Almost 85% responded with a Yes and rest responded with a No. Most of the people of the present generation in former Soviet Union begin to watch Indian movies much earlier in their life. This shows that the Bollywood has good chance of winning the hearts of youths as well and not just the people born in Soviet Union. Among the people who said they have never watched Indian movies or discontinued watching it, said that Indian movies have non-realistic similar plots, unnecessary songs in between the story and funny dances. This is the same reason why most of the Indians also do not like the movies of late 80s and 90s. Though some are exceptional. While Bollywood experienced its golden era in 50s and 60s, recently again we are getting to see new talent in the cinema, which can attract even those who do not like Indian movies. Whether it is geopolitics, business or culture, India has been slow in identifying and utilizing the advantage. India has such a matured film industry, using which it can create an interest for the country in the rest of the world. People attracted culturally means a positive uplift of the image of the country, which is at the moment is known as a poor third world country to many. Countries like Switzerland, New Zealand, Greece and even China are inviting Bollywood to shoot their films in their country which promotes tourism for them, it is high time for Russia to utilize this tool and make their country a well-known tourist spot. Влияние Болливуда на Страны Бывшего Советского Союза; Почему России и Индии Нужно Использовать Болливуд в Дипломатических и Деловых Целях. India and Russia traditionally enjoy warm relations since the Soviet era. It has been recently due to several geopolitical changes in a short period of time that the two countries are drifting apart. While the two countries maintain an understanding of each other, their priorities and personal interests do not align as much as they did earlier. In the midst of these global challenges, the two countries have been identifying new trade opportunities and diamond comes as a perfect solution. Unfortunately, both the countries have been struggling to meet their bilateral trade goals, which is mainly military based. Russia is the largest producer of the rough diamond. It’s state-owned diamond mining firm Alrosa accounts for 25 percent of the world output. India, on the other hand, is the leader in diamond processing. 93% of world’s diamond, whether they are in industrial use or in solitaire diamond jewellery, has been on Indian soil once for processing. Most of the Russian diamond eventually ends up in India for processing which is worth billions of dollars. However, a very small part of it comes via direct import. Most of the Russian diamonds take a long route before arriving in India, thus raising costs. In 2013, direct import of Russian diamond into India amounted at $767 million. India understands the value of direct import of Rusian diamonds and how this can help grow trade between the two countries, which has not met its potential despite decades of friendly relations. In 2016, India declared reforms ending the roles of intermediaries that were causing roadblocks in the import of Russian diamond. India also created a special customs zone in Bharat Diamond Bourse in Mumbai with relaxed taxation and customs to allow easy import of Russian diamonds. Moreover, India is testing an Israeli technology to ensure a standardised process of grading polished diamonds, which is important given the potential of diamond trade becoming another major area of cooperation between India and Russia. This new form of diplomacy will create a broader business cooperation involving private players and adding at least $4 billion to $5 billion in trade between the two countries. Currently, 50% of diamonds processed in India head their way to the US market. Russia accounted for only $8.9 million worth export of diamonds from India in 2011 despite Russia having $16 billion worth of diamond retail industry. This makes Russian market impressive for Indian companies making diamond diplomacy a win-win approach. So if you are going to a jewellery store or buy diamond pendants online, you can thank this low profile diamond diplomacy between India and Russia. India and Russia have been de facto geopolitical allies with the alliance dating back to Cold war era. Last week’s visit to India at the annual bilateral meeting by Vladimir Putin was as strategic as it has been symbolically perceived by the world. It has proved the mettle of Indian and Russian ties reconciling a strong partnership despite the ongoing global geopolitical realignment. The Indo-Russian annual bilateral meeting came at a time when Russia is battling with the ghosts of plummeting oil prices and facing the heat of Western sanctions springing from her Crimean annexation. On the other hand India is trying to catalyse her economic growth and improve her global standing under the new leadership. There have been hiccups in Indian and Russian friendship given the recent developments. Russian trade and arm deals with China and Pakistan respectively have irked India while India’s decision to buy Rafale fighters and Apache copters from France and US have met disapproving bristles from Russia. The meeting hence came at a very crucial juncture for both the countries. Putin’s visit that spanned less than 24 hours has definitely boosted the Indo-Russian ties with more strength. Putin brought along with him a delegation of 15, comprising of Russian business magnates to attend the summit. Putin-Modi meeting at the summit culminated with 20 agreements being signed by the leaders. Narendra Modi went on to say that Russia shall remain the biggest defence supplier to India. India and Russia signed major agreements on nuclear energy, crude oil and gas, defence, fertilizers, diamonds and space. Russia will be building 12 nuclear plants in India over the next two decades as per the nuclear agreement. Another major agreement involves Russia building her multi-role aircrafts in India; this would be first major defence project under Modi’s flagship scheme, “Make in India”. Russia’s state-owned Rosneft would be supplying 10-million-tonnes of oil per year to India. Apart from that joint hydro-electric power projects have been agreed upon. Both leaders have agreed upon a decadal roadmap to transform and improve the Indo-Russian bilateral trade. The trade and defence agreements show the vision of both the leaders to take the Indo-Russian relations to a higher trajectory. Certainly sends out a clear message about India and Russia being all-weather allies. India’s relations with the Soviet Union can be traced back to the 15th century when the Russian merchant Afanasy Nikitin visited Northern India and published an account of his travels. Soviets started developing friendly relationship with India since 1950s. The government of India approached the Soviet Union only when it got disgusted with the Anglo-American attitude of patronizing Pakistan at the cost of India because the latter had the courage to take independent line of action on several world issues. India and the Soviet Union exchanged military attaches in their respective embassies in 1955. By now India had signed numerous pacts with USSR. The weapons and defense equipment provided by Soviets were cheaper than that of the Wests. The Soviets also provided facilities to assemble the aircrafts and other equipment in India and gave training to Indian soldiers to operate sophisticated weapons. They dealt with India in soft currency unlike other countries who demanded hard currency. This system continued even after collapse of Soviets and development of Russia. The Russians considered India as an ally and continued selling weapons to India. Russia is India’s biggest arms supplier. This helps Russia to maintain its economy and fund its weapons industry. In recent years, India had been trying to develop its own aircraft with the help of the Russians. In the defence arena, the Indo-Russian relations have evolved from buyer-seller relationship to joint collaborators in such big-ticket projects as Fifth Generation Fighter Aircraft (FGFA) and BrahMos missile. The biggest USP of Russia for India is while other countries are reluctant to transfer technology; the Russians do it without any fuss. India cannot afford to sacrifice the current military cop-operation with Russia. In material technologies and strategic raw materials inheritance, Russian strength is well acknowledged, Russia is far better source for easier technology transfer than what India can ever hope from USA. One cannot forget that George W. Bush is pensioned and the U.S. Congress has a substantial chunk of Congress members heavily opposed to India’s nuclear power status due to India’s positions on NPT and CTBT. Moreover, India got itself tied-up with the Russians. India will need Russian support, be it on Kashmir or other matters at the UNSC, if India radically sways away from Russia, Vladimir Putin could anytime open up Pakistan military aid option. One cannot decline to discern that Russia is a factual Eurasion power enjoying the largest land mass in the world. It may possibly have the largest nuclear submarine fleet and one does not know how many Russians submarines are floating around India or the USA. Hence, irritating one such as Russia is out of question for India. Though, such an event doesn’t seem possible in the near future because Russia has always been friendly to India even during Soviet times when Uncle Sam looked the other way supporting Pakistan dictatorship against India. Any India connivance with a pro-America military alliance will cost us blood and other economic problems. India’s friendship with Iran and Afghan would get strained. This would result in decrease in supply of oil from Iran as India will have to follow USA’s policy of sanctions on Iran and it will also make hostile situations between India and Muslim countries. On the other hand, Russia supports both, Iran and Afghan. Russia has long been an invited observer of OPEC meetings and know their Arab friends quite well. Russia’s game in the world is open. Nonetheless, it does not foreclose India’s military cooperation with democratic forces in Asia vis-à-vis a potential Chinese power aggression. India needs to culture Russian relationship deeper so that it works as an antidote to any possible Sino-Pak aggression on India. American help in such a situation would mean confrontation, a Russian help peaceful compromise. If both China and Pakistan were to gang-up on India, the US, in order not to risk a nuclear war, will stay neutral. Russia, on the other hand, would provide intermediary help, because Russia has a certain strategic leverage on China. China needs Russia’s strategic alliance for SCO (Shanghai Cooperation Organization) to succeed. The SCO is a Eurasian Silk Road, which in the long run expectedly change the entire economic landscape of Eurasian continent, guaranteeing economic future of all involved. Why should India forego a chance for that reality by entering into U.S.–tailored Asian defense alliance principally designed to torpedo such developments to keep up U.S. predominance. Moreover, USA is one of the most self-centric country in the world. History is witness that USA is not a reliable partner in several areas, politics, military and hardware spare parts. India will be optioned to buy whole-system units at high prices, probably with loans from US Banks to get India mortgaged to the US as a permanent financial slave. Whenever and wherever US helped, it made sure it got something solid in return. Russia is a much more reliable partner as it has helped India on several occasions in many fields, politics, military, business, etc. Let it be the 1971 War with Pakistan or Nuclear tests or many other fields, it was Russia and former Soviet Union which stood by India and helped it to come over hard times. India will have to choose its friends and foes carefully in order to succeed in this modern world. TWR Note: Articles under students’ column are written by school going students. Readers and commenters are requested to maintain healthy debate avoiding the use of improper language. Please stay away from directing personal attacks.